Have you begun to question traditional best practices in business continuity (BC)? Do you seem to be concentrating on documentation rather than preparedness? Compliance rather than recoverability? Do your efforts provide true business value? 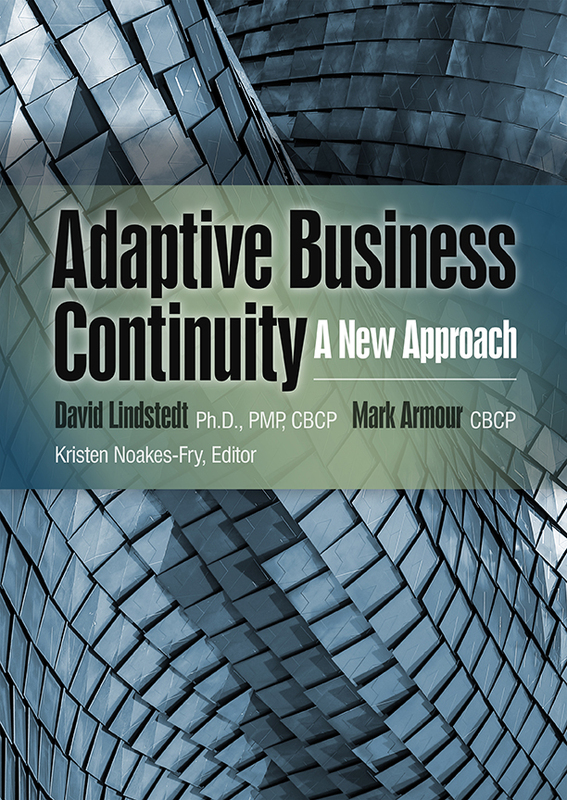 If you have these concerns, David Lindstedt and Mark Armour offer a solution in Adaptive Business Continuity: A New Approach. This ground-breaking new book provides a streamlined, realistic methodology to change BC dramatically. Adaptive Business Continuity: A New Approach uses the analogy of rebuilding a house. After the initial design, the first step is to identify and remove all the things not needed in the new house. Thus, the first chapter is “Demolition” – not to get rid of the entire BC enterprise, but to remove certain BC activities and products to provide the space to install something new. The stages continue through foundation, framework, and finishing. Finally, the last chapter is “Dwelling,” permitting you a glimpse of what it might be like to live in this new home that has been created. 2017, 186 pages, PDF eBook, ePub, or Kindle.